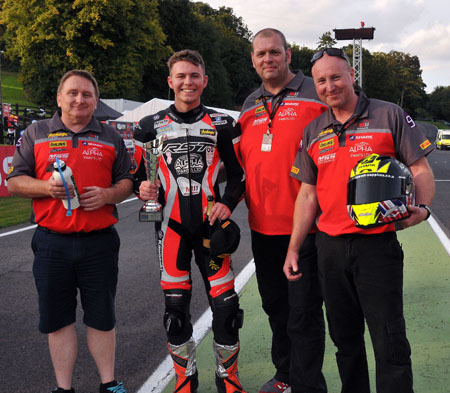 TEENAGER Josh Corner returned home from Cadwell Park with his biggest trophy haul and best set of results to date following his maiden Motorpoint British Supersport Evo win. The 17-year-old visited the podium twice on his MJJ Motorsport/Alpha Paints Ltd Kawasaki ZX6 at the famous Lincolnshire track. After grabbing another third place – his third podium since joining the hard-fought class late last season – during Sunday’s sprint race, the youngster was fired-up ahead of a wet feature race on August Bank Holiday Monday. Fast from the start, he hit the front of the Evo class almost immediately, and kept his head down while many around him crashed out. But Corner was happy with his bike and pressed on, fighting his way up to finish the race an impressive eighth overall and first in class. “It was just amazing, everything felt just perfect with the bike from the start,” he said. “I wasn’t sure how we’d go because the track was pretty wet but I knew straight away we had a great setup and I was able to really push. “I’d had a good race on the Sunday but I really wasn’t sure how Monday was going to pan-out. Once we got underway it was perfect. I loved every minute of it. I was aware I was up in the top 10 but as I’ve said before that doesn’t really matter. To me it’s all about getting to the front of Evo and that’s all I was interested in. *Josh will be next in action at Round Nine of the Motorpoint British Supersport Evo Championship at Donington Park over the weekend September 5-7, 2014.